One of the things I like to think about when walking around Manhattan is what’s going on underneath the streets of big cities. There are amazing things happening there. Take for instance this amazing story that dredged up in the foul innards of Usenet. Unfortunately I only found one good book on the subject – Underneath New York. 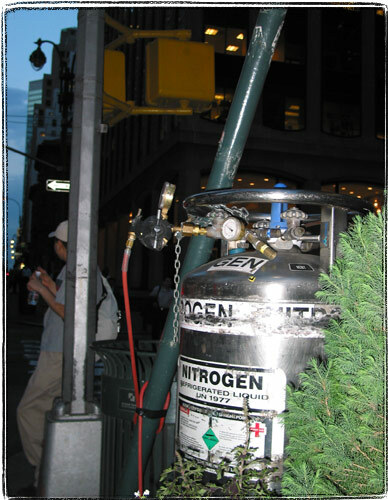 So I still had to sift through the mind numbing chatter of Usenet to find out what is the deal with those liquid nitrogen tanks that are very common in the streets of Manhattan. Apparently they use nitrogen to prevent underground fires and explosions. But who knows, there could be a race of nitrogen breathing creatures living there. Or it could be that city workers are making icecream down there.